Cheesy epigraphs aside, the Boston Celtics claimed game No. 2 in an overtime thriller, beating the Washington Wizards 129-119. 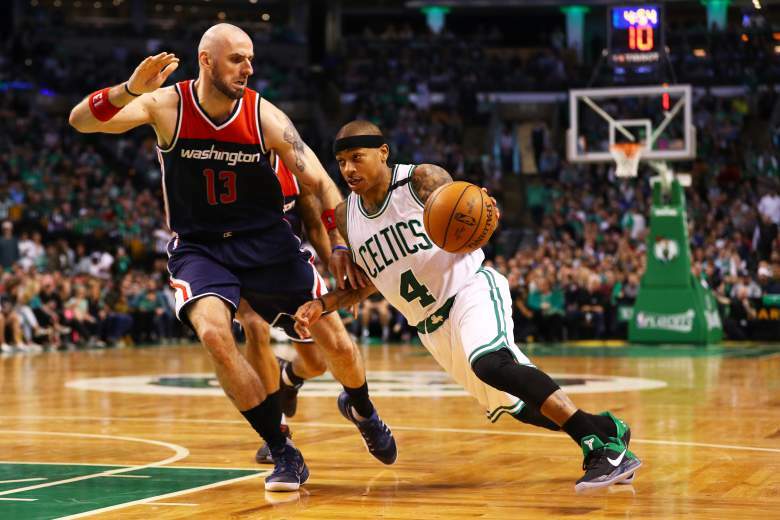 The man behind the victory was point guard Isaiah Thomas who scored 53 points, with 29 coming in both the fourth quarter and overtime period combined. Throw in Al Horford’s double-double, key defensive plays by Avery Bradley down the stretch, double-digit scoring efforts from Crowder and Rozier — and you have the team effort that the Celtics desperately needed to route their comeback late in the fourth quarter. For Thomas though, this game was more than just another spectacular performance. “Everything I do is for her,” Thomas said following the game. Today would have been his younger sister’s twenty-third birthday, and you can almost assume that it certainly played a hand in his performance. After waging a 46 minute long battle with John Wall, trading jab after jab, Thomas miraculously tapped into a latent reserve of energy and intensity that Wall and the Wizards simply couldn’t match. Obviously you could attribute that to a war of attrition, but it felt like there was almost something metaphysical about Thomas performance. His charisma, passion and perseverance was infectious, manifesting itself in Avery Bradley’s late game steal or Rozier’s dagger at the end of regulation. Boston’s performance was far from perfect though, no matter how entertaining their short coming’s made the game. Thanks to the Wizard’s bevy of capable three point shooters, there’s nowhere the Celtics can really hide Thomas, making the small pick ‘n rolls much more frightening. Look no further than the first quarter, where Wall put Thomas in early foul trouble by just isolating him on the weakside via the pick ‘n roll. Another big takeaway was how susceptible the Celtics are to giving up big runs, which became particularly obvious in the first and fourth quarter. The Celtics thrive in situations where they’re allowed to set their half court defense and then attack in transition, but they’re practically helpless once their opponent starts attacking them in transition. Just take a look at their first two games against Chicago, where Rondo crushed them pushing the ball up the floor. Now consider a point guard like Wall, who possesses a great feel for finding the open man at break neck speeds. The Celtics will be leaving the deafening halls of TD Garden for game’s No. 3 and No. 4, but hope to carry the momentum they’ve gathered with them. If they have learned anything from the last series, no 2-0 lead is safe. game No. 3 kicks off on May 3rd at 8 p.m.